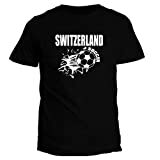 Switzerland Soccer t-shirt is a premium quality that will get the atention of friends, family members and even people in the street for its unique design and message. This is perfect for Father’s day, St. George, Christmas, New Year, etc or any other special occasion. Our designs are available on a wide range of apparel such as tank tops, sleeveless t-shirts, t-shirts, sweatshirts, hoodies, baby bodysuits, maternity t-shirts and more. Made of 100% cotton, you will feel the softness of our t-shirts as soon as you put it on, you will immediately fall in love, giving you the best feeling. We use the latest in garment printing technology to bring you high quality digital printing t-shirts. The garment is full machine washable. If you are looking for unique designs, you have come to the right place. Visit our store where you can find thousands of awesome designs that means you can you choose from a wide variety of cool designs. This entry was posted in Soccer and tagged Countries, Idakoos, Soccer, Switzerland, TShirt by FPSports. Bookmark the permalink.